During the early months of 2017, Stephen Clark approached Budden Book Reviews directly about the possibility of reviewing his upcoming title, Citizen Kill. The premise of the story was definitely intriguing and I admit to having enjoyed the story, even though there were parts of it which made me cringe. Without going into the full synopsis, the U.S. government - as depicted in Citizen Kill - takes what appears to be a terrorist attack and uses it as justification to prevent future attacks by creating Operation Prevent. What exactly is Operation Prevent? It's an operation with the sole focus of eliminating U.S. citizens who are thought to be radicalizing Muslims - the end result: to terrorize the U.S.A. This fatal sentence was to be carried out without any form of judge and jury, without even a formal investigation. If it looked suspicious and felt suspicious, it was grounds for elimination. There is one operative I got to know - Justin Raines, an operative who was on suspension, an operative who lost the love of his life when a mission went bad. Helping to carry out Operation Prevent was his ticket back so, despite his doubts, he went ahead with his first few assignments - no questions asked. Throughout the story, I grew to care about Justin Raines, though I hated the atrocious acts he committed against others; it didn't matter that he was carrying out orders which came from above. I yearned for him to grow a conscience, to start questioning his orders. I begged him to open his ears so he could listen to his targets as they pleaded for their lives, as they told him truths he couldn't imagine to be true - until, miraculously, a doubt crept in, followed by another. Before long, I was following Justin even through his sleep, if that's possible - planting ideas in his head of the steps he should take, of the people he should see, of the questions he should ask. I, finally, started believing he could turn out to be one of the good guys. Another story which ran concurrently, yet seemingly unaffected by - and contrary to - Operation Prevent, was of the President of the United States. She lost her son and was tempted to give up her presidency yet, having gained the fortitude to try to commit to the term she was elected, she ended up befriending a father and daughter, even inviting them to live in her family's home. It was a questionable action which didn't sit well with her peers, especially considering their ethnicity. 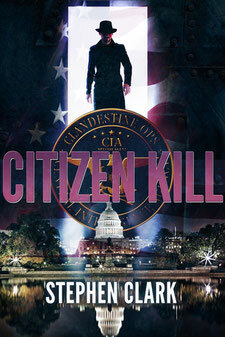 Citizen Kill took me on a soul-searching journey. It made me ask questions I've never asked of myself. It begged the question, "How far would I go to save my country?" Being a civilian, have you ever asked yourself to what lengths you would go to save your country? If you haven't, should you choose to read Citizen Kill, it will be a question you'll probably have answered for yourself before you've gotten half way through the story. If you are interested in learning more about this book (which I highly recommend) click here to be taken to Citizen Kill's page on Amazon.